Create ArchiMate diagrams. Sign up for a Trial Account. View an interactive example in the Dragon1 Player. 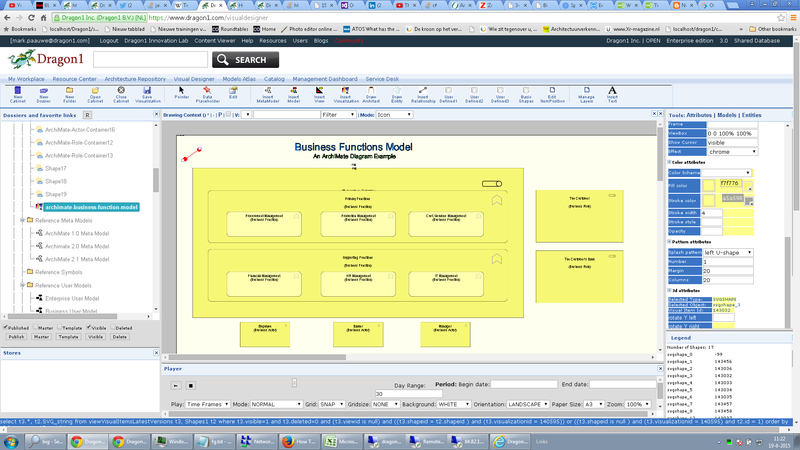 Do you want to create an ArchiMate Business Functions Diagram like the one above? Then read the following ArchiMate Tutorial. In ArchiMate viewpoints are defined as the place where you are looking from. A view is defined as what you see when looking from that viewpoint. In ArchiMate a view is specified with a viewpoint. For every defined viewpoint a meta-model is documented and an example view is provided. On this page we will show you how to create an ArchiMate Business Functions View, based on the ArchiMate Business Functions Viewpoint. Screenshot of the Architecture Repository Web Application. On Dragon1 you can use the Architecture Repository web application to enter data manually or to import the data automatically. There are 400+ default entity classes you can enter, from a product, process, service to an application, database, network, server and client. 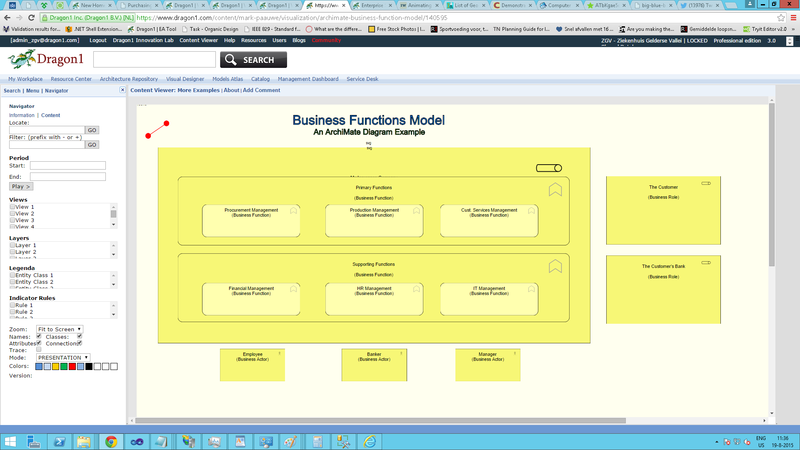 Here you see a screenshot of the Architecture Repository where on the ArchiMate canvas the Business Functions are entered. You see a drop-down menu from which you can select an entity class to insert into folders. You can also select and enter Business Roles and Business Actors. 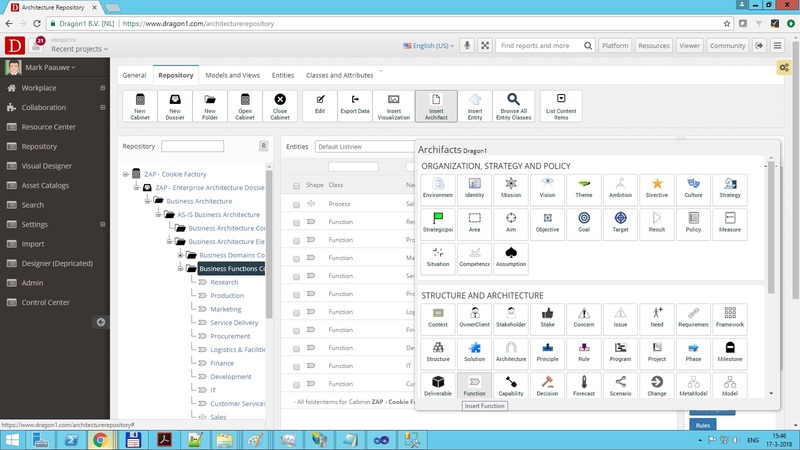 These three entity classes are needed to create a complete ArchiMate Business View, compliant to the Viewpoint. At this point we have not chosen a metamodel, so we are not limited by entering or documenting whatever entity class we like. The data you enter is stored 'logically' in a cabinet/dossier/folder structure that you can create and change to your likeness. You can enter, share and hide folders and data with or from team members. Data is entered normally via the New/Edit dialog. If you click on an entity class in the drop-down menu that is visible in the screenshot above, the New Edit Dialog will appear and you can enter data and click ok. Then the data you have entered is placed in the database. Insert Business Functions, Business Actors and Business Roles using the New/Edit Dialog. 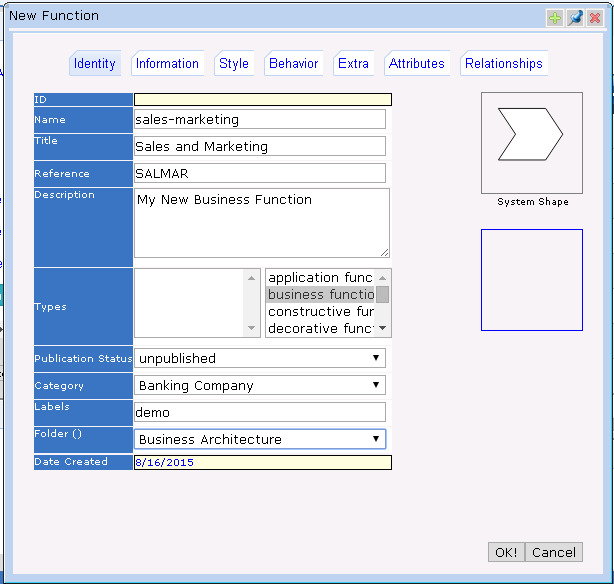 Screenshot of the Architecture Repository showing a model. In the Architecture Repository, but also in the Visual Designer, you can create or draw models compliant to meta models. Creating a model is only a matter of relating entities with each other: create a relationship between two entities and you already have a model. 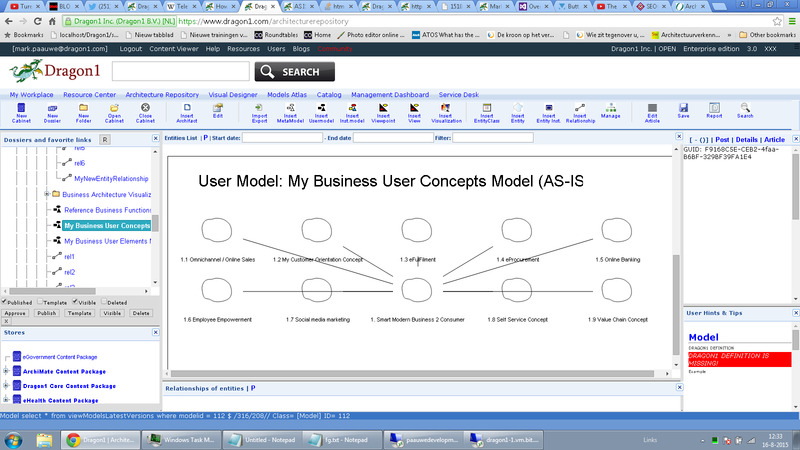 You can create models and meta models or alter existing ones. Above you see a screenshot of the Architecture Repository with the model item in the tree view selected. The model (the relationships between entities, if any) is shown. Above you see a figure of the defined standard meta model for the Architecture Business Functions Viewpoints. So this meta model limits the entity classes we may use to create a model with. 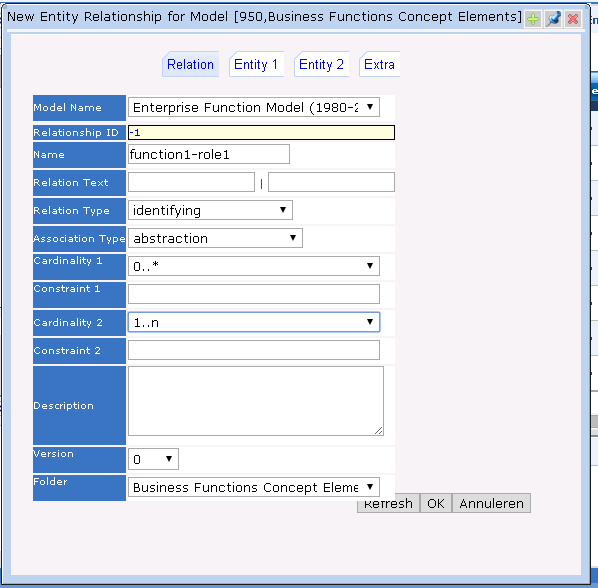 As you see we may use three different entityclass to create a Business Functions View: Business Function, Business Role and Business Actor. Data is normally entered in the Architecture Repository via the Insert Relationship. On the menu bar you just need to click the menu item and the dialog will appear. Enter the name of the relationship and select the two entities you want to relate with each other and select the type of relationship between the entities. On Dragon1 you can draw visualizations in the Visual Designer like you are used to in PowerPoint or Visio. But you can also draw or insert Visual Items. these are data/shape-placeholders. You just link the Visual Items to entity classes present in the data stream of a model to a visualization canvas and configure what shape in what pattern should be drawn on the canvas. 'Visual Items' is an innovative and unique visualization feature that simplifies the generation of visualizations. Also when the model data changes, you do not need to change the visualization template (a canvas with visual items). Select the visual items, click edit and configure them to draw the available actors, roles and functions in a certain graph/pattern on the canvas. Now you have created your ArchiMate diagram and it is time to it share with others. You have the option to publish your visualization publicly or privately in the Dragon1 Content Viewer. Users can if they want and if you have enabled the option, leave comments on your visualization, for you to improve it. Now your visualization is available for search and for preview in the Dragon1 Content Viewer. Do you want to create an Architecture Diagram yourself? These kind of architecture products can be created with Dragon1 PRO. Purchase online your Dragon1 subscription today. On Dragon1 Free templates are available to be more productive when creating diagrams.